Good nutrition supports active bodies and minds. Howell Mountain School provides our students with a nutritious breakfast and lunch through our food service program. We serve breakfast daily from 7:30 to 8:20 a.m. and offer a “second chance” breakfast during the first break. Students may only eat one breakfast per day. Students who receive free or reduced price meals may receive one of each meal (breakfast and lunch) at the subsidized rate. If the student opts for a second chance breakfast or a second lunch, we must charge those meals at the regular rate. Please make sure your child understands this limitation. 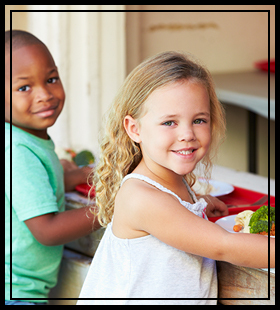 Our food service programs is subsidized by the National School Lunch Program (NSLP). We encourage parents to apply for the program even if you are not sure your family will qualify. If you are denied and your financial situation changes during the year, even if it’s only temporary, please reapply. You may qualify with the new information. Download an application or request one from the school office or cafeteria. We do not permit students to charge meals. However, we’ve made paying for meals easier than ever. You can do so in person at the cafeteria or online through our MealTime portal. The portal accepts credit or debit card payments and allows you to see your child’s activity in the program.